Myanmar’s Karen Cease-Fire in Jeopardy - Integration Through Media ....! 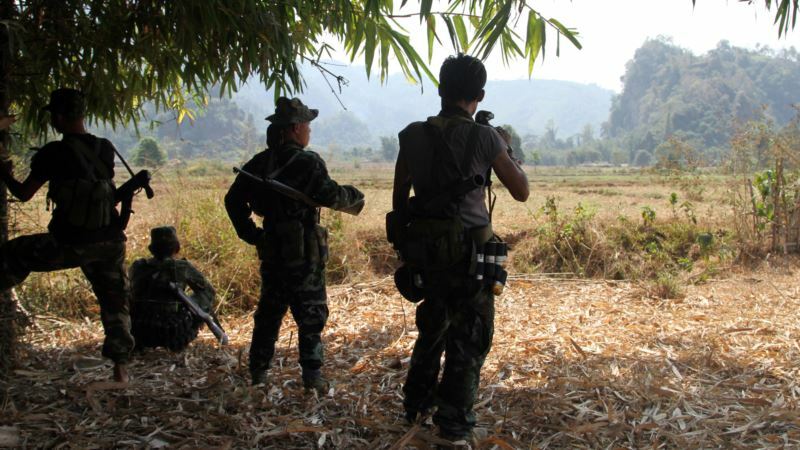 (VOA): Clashes and mass displacement in Myanmar’s southeastern Kayin State have deepened doubts that the world’s longest-running civil war, involving the Karen ethnic minority, can be resolved under a peace process led by Aung San Suu Kyi. According to the Karen Peace Support Network, a network of community-based organizations, on March 4 more than 600 Myanmar army soldiers descended from their bases to civilian areas claimed by the Karen National Union (KNU), which has been in rebellion against the central government since 1949 but signed a cease-fire in 2012. The Myanmar army, on a mission to repair a dilapidated road in Hpapun district in northeastern Kayin State, near the border with Thailand, exchanged fire with KNU soldiers and local militia. This prompted more than 1,500 villagers to flee to areas of surrounding forest, where they remain with dwindling food and few medical supplies, according to Saw Way Lay, a spokesperson for the peace support network. Saw Tender, a spokesperson for KNU’s Brigade 5, which holds sway in the area, told VOA that clashes lasted from March 4-9, without casualties. Both sides are now “waiting and seeing,” he said. The Myanmar army, dug in by the road, has not advanced farther. “Tension is still high,” Way Lay said, claiming that Myanmar troop numbers have since swelled to more than 800. On March 15, the Myanmar army clashed briefly with KNU Brigade 5 soldiers elsewhere in the district, with no apparent casualties, the Yangon-based news outlet The Irrawaddy reported. Repeated calls by VOA to the military’s official Information Team, and to state government officials, went unanswered. Senior government spokesman Zaw Htay said he was unable to comment on military matters. On March 16, the KNU released a statement calling for Myanmar army troops to withdraw so villagers can return, for local and international organizations to help provide relief, and for peace talks to be expedited. KNU members have submitted a complaint to the Joint Monitoring Committee (JMC), the official body for monitoring and implementing a 2015 nationwide cease-fire pact between the government and eight armed groups, which last month increased to 10. Min Zaw Oo, executive director at the Myanmar Institute for Peace and Security, told VOA the JMC is now holding crisis talks about the clashes. An official JMC source refused to comment to VOA, citing the sensitivity of the issue, but a public response is expected soon. Among Myanmar’s ethnic armed groups, the KNU has been the most active proponent of the 2015 Nationwide Cease-fire Agreement (NCA), sometimes in the face of strong criticism from sections of Karen civil society, who view it as a weak deal. The top leadership retains regular contact with the Myanmar government and military. However, confidence within the KNU and Karen society has been sapped by the repeated deferral of political dialogue toward a federal restructuring of power, to satisfy long-held demands for meaningful autonomy from across Myanmar’s minority ethnic groups. The March clashes mark the largest flare-up and community displacement in Hpapun district since the 2012 bilateral cease-fire. The area, which has stayed remote from central government control since before the British colonial era, was ravaged by a conflict that pushed tens of thousands of Karen refugees into Thailand, where many remain or have been resettled in third countries. Saw Tender and Saw Way Lay both told VOA the road was solely for military purposes, to transport heavy weapons and speed up troop rotations. This seemingly contravenes an informal agreement that the Myanmar army can only resupply their bases on foot or by mule. Way Lay pointed to other military-built roads in the district. “The villagers cannot use them, only the government troops do. Even to cross the road is difficult for [villagers],” he said, adding that the NCA has enabled the Myanmar army to upgrade existing camps and establish new ones, making local Karen perpetually fearful and insecure. In its March 9 statement, the Karen Peace Support Network accused the Myanmar army of violating the NCA by entering KNU territory without permission, and demanded an independent probe into the clashes. However, Min Zaw Oo cited a lack of clear demarcation of territory in bilateral cease-fires with the KNU and with other ethnic armed groups. During NCA negotiations in 2015, the issue was deferred to the JMC. But, at the JMC, he said, the issue has been deadlocked. “If demarcation is clearly settled, we can avoid these kind of cases,” he said. The clashes also dampen prospects of any large-scale return of the more than 100,000 refugees remaining in the Thai border camps. So far, only 71 have returned under a formal, United Nations-supported process, with more returning informally. However, UNHCR said they would aid individual repatriations if voluntariness could be confirmed, the return location verified as safe, and the agency’s continued access to it for monitoring and support guaranteed by the Myanmar government.